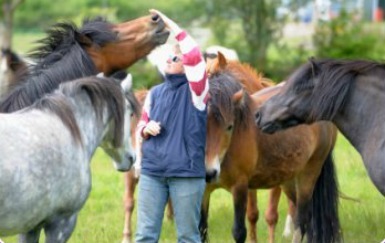 Are you interested in becoming a horse trainer? Dream about making a career with horses at the center of it? Want to learn how to obtain horse trainer certification? You’ve come to the right place to learn about how to be a horse trainer. To become a horse trainer you needs lots of experience. You will need to spend a lot of time riding horses, or you won’t be able to follow your passion of being a trainer. Ride as many different types of horses that you can. The more you do this, the better you will become. You will also need to continually strive to improve your techniques and general horse knowledge. There is no centralized body of certification for becoming a horse trainer in the USA. However, there are many organizations that offer independent certification. Many times the best trainers were often those that had tons and tons of experience training horses. They had never set foot in a class, and didn't have an equestrian degree. It is still fairly common in the horse world today that trainers are not certified. It depends on the level the horse trainer is working at. In the good old days anyone could call themselves a horse trainer, and you will still see that today. Nowadays becoming a horse trainer as a career is more likely to involve higher education with a degree or certification combined with a lot of experience. For a college degree, that means you will have to attend a school. This could be a four year or two year equine science program or equine management program at an accredited college. Another option is to find a 4 year college with an intercollegiate team. You can pick a major and try out to ride on the team in college to gain more experience. You will earn a bachelors degree by studying for four years and an associates degree for completing a two year program. When becoming a horse trainer there are also certifications available that are breed or discipline specific. For instance, if you are interested in hunters and jumpers, the United States Hunter Jumper Association or USHJA offers a trainer certification program. If your passion is gaited horses such as Paso Finos, there is the Professional Paso Fino Trainers‘ Association. They offer certification in training of Paso Fino horses. Other programs are general horse related certifying organizations such as the Certified Horsemanship Association or CHA. There are also training programs such as Linda Tellington-Jones’ TTouch program that is a fusion of equine bodywork and horse training techniques. There are also college level programs based in natural principles that offer clicker training for horses as part of their curriculum. There are many people “training” horses that really have no business doing so. They lack skills, honesty, work ethic, people skills and common sense with horses. You can check out my horse training prices page to see some of the common pitfalls these so-called “trainers” pull on people. You can also get an idea what types of things horse trainers charge for. You should already be an experienced rider before you start training a horse for riding. Start taking on easier project horses for other people to increase your experience in training. Whether that means you start out riding horses that need to be tuned up or assist an established trainer when starting a green horse, get out there and work! Don’t be afraid to muck stalls, feed, care for horses or be a groom or exercise rider. You can learn a lot about equine behavior and becoming a horse trainer if you keep your eyes open in every situation. Every time you interact with a horse you are training it somehow! If you can, become an apprentice or working student for an established trainer. This is still one of the best ways to become a horse trainer. Start by figuring out what kind of training you are interested in and research established trainers that do what you are interested in. Apprentice and working student positions are generally unpaid. You should receive lessons and knowledge in exchange for the work you provide. This is a position where your work ethic should shine. Trainers don’t have time nor the inclination to keep lazy people around! I hope you have enjoyed learning about how to become a horse trainer. Remember, hard work, motivation and willingness to learn all you can about horses will get you a great start in training horses!